Carlos has posted a more formal schedule of mixed-terrain rides leading up to the LRLR (La Ruta Loca Randonee) in July. All are welcome, you really don’t need a 5″ travel dualie to play along - riders have done these with smooth-tired 28mm-shod road bikes. I’ve done most with my Quickbeam or the Hilsen - using 33 1/3 Jack Browns, 32 mm Paselas and 35 (actual meas) Michelin Cross tires. 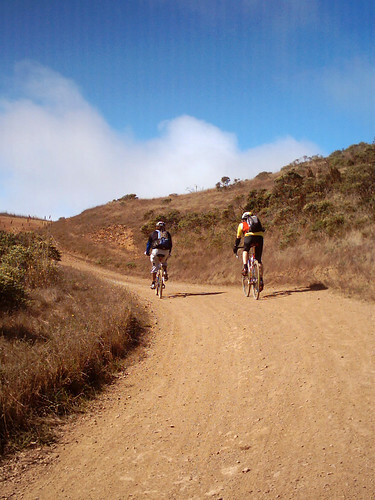 Despite our dire warnings, there are usually ways to bail from most of these rides which put you reasonably quickly back to civilization (probably not so much once you get out to Bolinas Ridge or thereabouts, though…). But, you do need to be reasonably self-sufficient. And, if you ride in SF Bay area, you know that it is the queen of the microclimates, so layers are helpful. If you’ve had some interest in this type of riding and want to check it out - pick a ride and we’ll see you on the trails!